"Probably don't knock at all"
Even though it's not entirely awful, Don't Knock Twice, directed by Caradog James, embraces too many tropes of bad modern horror movies to distinguish itself from the pack in any meaningful or memorable way. Jess (Katee Sackhoff), successful sculptor married to a wealthy banker, is looking to reconnect with her daughter Chloe (Lucy Boynton), whom she was forced to give up nine years prior. Chloe resents her mother, but needs her help - a supernatural curse has claimed the life of her boyfriend Danny (Jordan Bolger) and is now after her as well. Supernatural horror works best when it has a clear set of rules or a recognizable pattern to it - Freddy Krueger's powers only work in dreams, the tape kills you in seven days etc. In Don't Knock Twice, the only rule seems to be that if you knock on the witch/demon's door twice, you're marked for death. Beyond that, it's a bit of a free-for-all - Chloe's boyfriend Danny is killed almost immediately after, but even though Chloe knocked on the door at pretty much the same time, she doesn't get taken until the end of the movie. The witch's powers are whatever the movie needs right now in order to be scary - she can manipulate people's perception, enter their dreams (even if they're not marked, as she does this to Jess for no apparent reason), bend time and space, turn off lights etc. At one point Jess and Chloe decide to remove every door from the house and burn them, suggesting that her powers are door based (in previous scenes, she appeared after knocking twice herself), but in the very next scene, the witch conjures up a door of her own. One possible explanation as to why she doesn't grab Chloe right away like she did with Danny is that Chloe is protected by the love of her mother, but that's completely void when later on, the witch takes Chloe even though Jess is right next to her. 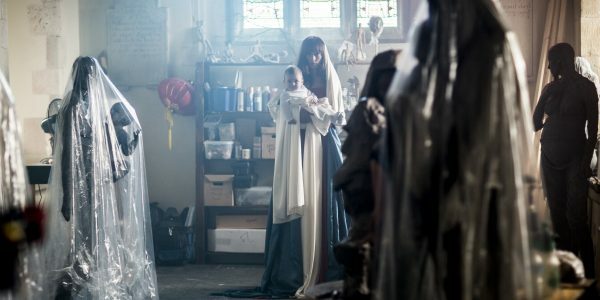 It's often said that people fear what they don't understand, but the witch in Don't Knock Twice is so poorly defined that you're more likely to be confused than frightened. The movie complicates this further by making her motivations uncertain as well, as throughout the movie it's not clear if the witch wants to kill whoever knocks on her door, or if she's after direct revenge for something Chloe did years ago - when the truth is revealed, it makes even less sense. The fear factor isn't helped by the fact that most of the scares are overtly and blatantly telegraphed. Cheap jump scares in which something pops up on the screen while loud music kicks are far too frequent, while some of the potentially subtler moments are ruined by their predictability - if you hold ominously on a shot of Chloe's soup for more than a few seconds, I'm not going to be surprised when something creepy happens with it a few seconds later. That being said, Don't Knock Twice does a few things right - the witch may not have the most original design, but her appearances are done almost entirely through practical effects, which are pretty convincing and well done. Some of the early parts also show promise - the scene where the witch kills Danny comes closest to being genuinely scary and unsettling. It also looks like a theatrical release, and not like a cheap low-budget throwaway like a lot of other modern horror movies. Performance-wise, everyone does a good job, even though the movie doesn't give them a lot to work with. 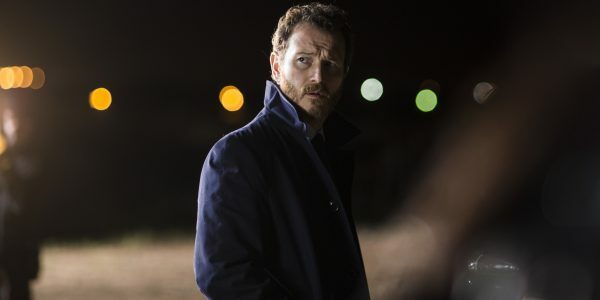 Nick Moran pops in as a police detective and steals the few scenes he's in. I wish the movie developed the relationship between Chloe and Jess more, as it never really seems to go anywhere. You expect that Chloe eventually starts calling her "mom", instead of "Jess", the lazy writer's shorthand to resolving a conflict between a parent and a child, but that doesn't happen. Don't Knock Twice would have been a lot better if it dialed down on the jump scares and focused more on the mother and daughter relationship. Make it so that it is Jess's love for her daughter that keeps her safe from the witch and build the climax around Jess deciding to sacrifice herself to rescue Chloe. A tragic ending like that would give the movie some much needed dramatic weight. Instead, Don't Knock Twice ends on an oh-so-predictable "the monster isn't really gone" moment. That's not even a spoiler since practically every bad modern horror movie ends the exact same way. The whole purpose of having an ending like that is that it's supposed to be a surprise - just when you think it's all over, the movie throws in one final scare to rattle you - but it's so extremely overdone that it's pretty much par for the course. It'd be more unexpected if a horror movie didn't go that route. Overall, Don't Knock Twice is a mostly inept and rather forgettable horror movie, with a couple of good moments and mostly decent performances.